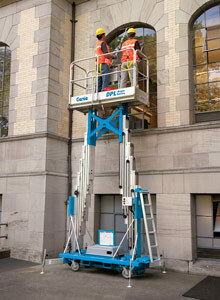 The Dual Personnel Lift, DPL, has a working height of 36 ft and is ideal for areas where weight is an issue. Perfect for gymnasiums and churches, which have fragile floors, it is easy to use and can have two people on the platform at a time giving workers a more stable and efficient work environment. Use our Super Straddle for theater work! For delicate work areas check out our UL-24, UL-32, UL-40 and our UL-48.